Nose Revision Surgery and Surgeons: Refining the nasal tip with Newer VDD techniques. Refining the nasal tip with Newer VDD techniques. Nasal tip surgery is among the most complex and difficult tasks in rhinoplasty surgery. Vertical dome division (VDD) is one of a variety of techniques that may be used in refining nasal tip appearance. Collectively, vertical dome division (VDD) refers to one of many methods of vertically dividing the lower alar cartilage at or near the dome to modify nasal tip aesthetics. The technique was originally recommended as an alternative in altering tip projection and appearance while minimizing use of implants and the degree of postoperative tip ptosis. Vertical dome division (VDD) targets various nasal deformities, including overprojection or underprojection, suboptimal rotation, disproportionate lobule ratios, and broad or asymmetric tip. The surgeon must strive to achieve an aesthetically pleasing nasal tip that is in balance with the remainder of the nose without compromising nasal airway function. The typical patient presenting for vertical dome division (VDD) usually has a poorly defined or malpositioned tip with a combination of abnormal projection/rotation, broad or amorphous lobule, asymmetric tip defining points, and/or boxy, trapezoidal base. Adherents to this principle argue that horizontal excisional techniques rely too heavily on unpredictable and uncontrollable postoperative scarring to produce desired tip results. Proponents of vertical dome division (VDD) believe that vertical incisional and excisional techniques, on the other hand, offer a more definitive and reliable means to achieve desired tip changes. In principle, the technique of vertical dome division (VDD) separates the medial and lateral crura into 2 independent units. 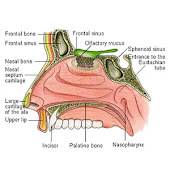 By transecting the dome, the inherent spring within the arch is released and allows realignment of the newly divided medial and lateral segments to reconstruct the nasal tip. The lobule is defined as the portion of the nasal tip complex that is situated anterior to the nostrils; it extends from the tip defining point to the junction with the columella, as observed on base view. The alar cartilage (lower lateral cartilage) is C-shaped and can be divided into the medial, middle, and lateral crus. The middle (intermediate) crus comprises the domal segment and largely influences the shape of the lobule and, therefore, the form and definition of the nasal tip. The dome is considered the highest arching segment within the nasal vestibule. The lobule size can be assessed in comparison to the columellar length. If the base view demonstrates a columellar-to-lobule ratio of approximately 2:1, the structural support and configuration of the nasal tip is considered adequate. A long nasal length reflects an acute nasolabial angle; a short length reflects an obtuse nasolabial angle. The anatomy of the nasal tip is often described using the tripod concept to facilitate understanding of the key structural components and to provide a simple explanation of tip dynamics. According to this analogy, the cartilaginous framework of the lower third of the nose is compared to a tripod that is attached to the facial frontal plane. The 2 individual lateral crura represent 2 legs of the tripod, and the conjoined medial crura and caudal septal attachments correspond to the third leg. By lengthening or shortening any or all legs of the tripod, the changes that will be effected in tip projection and rotation can be predicted. For instance, techniques that augment or lengthen the medial crural segment enhance projection. Shortening the medial crura or disrupting their septal attachments without reduction of lateral crural length decreases projection and rotation of the nasal tip. Shortening the lateral crura and maintaining or lengthening the medial crural segment would be expected to increase rotation. Vertical dome division (VDD) is predominantly contraindicated in patients with relatively thin skin. These patients are particularly prone to developing visible cartilage edges along the nasal tip region. This results from contraction of the thin overlying skin and soft tissue envelope around the new and more prominent medial cartilaginous strut. A thick overlying skin and soft tissue envelope is better able to cushion the appearance of prominent cartilaginous structures, such as those in vertical dome division (VDD). Avoid classic vertical dome division (VDD) in patients who show evidence of already weakened lateral nasal walls. Dividing the domal region without reapproximation of the cartilage segments disrupts the integrity and continuity of the lower lateral cartilage. The lateral nasal wall is more susceptible to structural collapse than the newly reinforced medial footplates. As a result, lateral wall weakening and collapse are further potentiated. The original technique is highly focused on manipulation and repositioning of only the medial crura, with no attempt made to reconstruct the remaining lateral crural segment and alar rim. Postoperatively, the medial crura and columella are sufficiently stable to resist loss of projection. Some loss of lateral support, which could result in lateral wall collapse and alar retraction, may occur. Vertical dome division (VDD) is also associated with bossae formation. This is most frequently seen in patients with thin skin and firm cartilages. Disruption of the underlying vestibular mucosa and skin, such as in the Goldman technique, also predisposes the patient to possible stenosis. With use of newer modified techniques (Hockey stick excision, Lipsett, Simons, Adamson, and others) and caution, vertical dome division (VDD) can be used successfully in nasal tip refinement with limited postoperative complications and reliable long-term results. Most practitioners using vertical dome division (VDD) today perform some modification of the original Goldman tip procedure. Adamson reported that approximately 5% of patients required revision surgery for postoperative tip abnormalities and irregularities attributed to use of vertical dome division (VDD). These abnormalities were primarily nasal bossae and lobule asymmetries. Abnormalities were nearly 3 times as likely to occur in revision cases as in primary rhinoplasty; incidence was lower with use of the incision and overlap method. Vertical dome division (VDD) is likely to remain controversial in the future. As knowledge of nasal tip surgery evolves, so too will further modifications of our existing tip techniques to attain more predictable outcomes. Today's trends in nasal tip surgeries are for improved visualization with preservation of the cartilage as well as better medial stabilization and support. These tenets are inherent in vertical dome division techniques. It is important to remember that VDD is an incisional technique that allows for repositioning of the nasal tissue and should not be combined with excisional techniques. One should always leave behind more than one takes. Preservation of at least 6-8mm of lateral crus will help prevent alar collapse and help stabilize the nasal base as well as allow for a strong natural-appearing tip.VDD allows for narrowing, rotation, and change in tip projection by repositioning rather than excision of any sizable amount of cartilage. The employed technique is a new modification of previous techniques. 3-10 The technique employs an open approach in which a strong columellar strut inserted and a portion of crura is removed near the dome (the cornerstone of our new technique of tip surgery). Depending on the deformity, this segment may involve intermediate, middle or lateral crura with or without removal of vestibular skin considering its thickness: thin skins are not resected, but thick skins are usually removed. Our technique involves the overlapping of the incised edges of the medial and lateral segments, and suture approximation to restore the integrity of the alar cartilage. The technique allows a more stable configuration for the maintenance of nasal tip support. The overlapping and reapproximation of the medial and lateral units ensure the long-term stability of the newly reconstructed nasal tip complex, and reduce the tendency towards postoperative cartilaginous abnormalities that may accompany scar fibrosis and contracture.